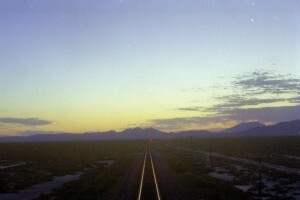 Somewhere around the Utah Nevada border, early in the morning, looking toward the rising sun. I secretly want to buy a modest plot of land out there somewhere, where Nevada meets Utah or Colorado meets Arizona, with water and hook-ups and a concrete slab big enough to park a trailer on, and spend the rest of my days listening for the freights and writing. My grandfather, great grandfather, great-uncle, great great-uncles and great great grandfather all worked for the Great Western Railway, or GWR, in England, as did the widow of one of them, for a total of over 250 years between them. Trains are in my blood. Long before I knew about the lives of all those ancestors, the genes first manifested themselves in the countless hours I spent trainspotting as a child in Birmingham. Steam trains were my first passion, and I pursued them for years, even as they were becoming, inevitably, extinct in ordinary railroad life. They had too little power compared to the diesel and electric locomotives which replaced them. Until they expired, I sought them out. It was a great hobby, combining travel, exploration and the simple goal of seeing steam locomotives at work and at rest. 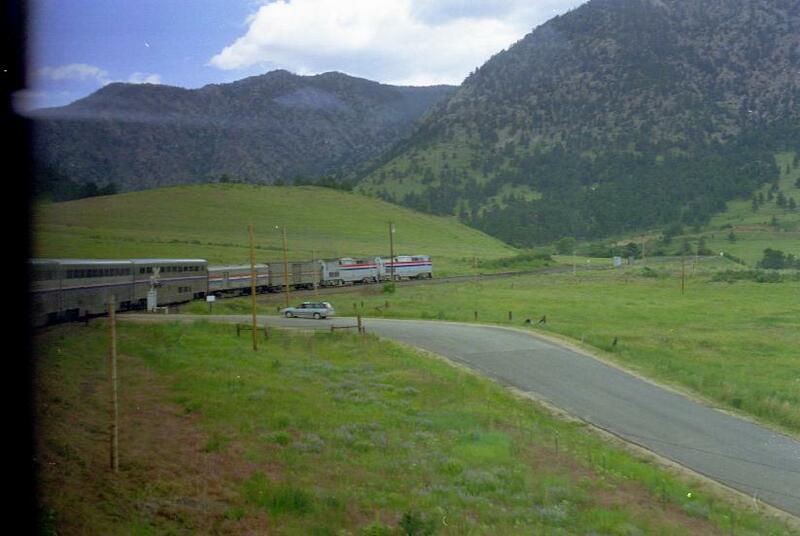 On a Rocky Mountain prairie an hour or so west of Denver, we caught our own locomotive crossing a rural road. Back in those years, dad gave me a four volume set of railroad books, called “Railway Wonders of the World,” which his father had given him in the 1930s. One of those wonders was the building of the transcontinental railroad across the US, a monumental endeavor started by President Lincoln in 1862 and first completed in 1869. I marveled at what they had built and how they had built it, and studied the pictures of the land that the railroad crossed. 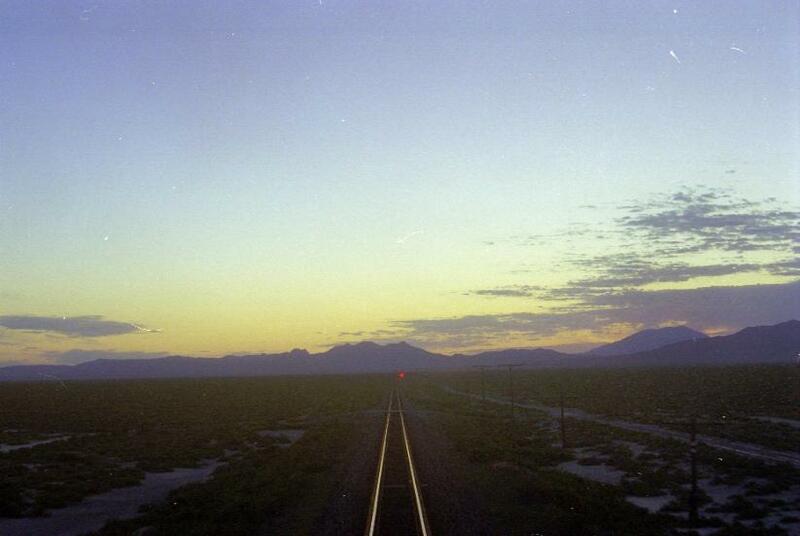 In the back of my mind was a secret longing to travel those rails and see that land. The Feather River Canyon, from dad’s amazing four-volume book. This was actually the last railroad built across the Sierra Nevada, completed in 1909. Fast forward to 1997, when we fulfilled that childhood dream, taking Amtrak across the USA, from New York to California, on our way from a forest outside Paris to the shore of the Pacific Ocean. True, we had a lot of baggage as we were moving house, a total of 17 pieces on the train, and true, we did not know exactly where we were going to live or even how we would live once we arrived in Santa Cruz, but what a trip! We were only required to change trains once, in Chicago, and had a family compartment from there all the way to Oakland. That meant four bunk beds and a bathroom next door! There was a restaurant car on the train, with a glass dome revealing the mountains and the sky, and longish stopovers in places like Denver to explore and grab a bite somewhere other than the train. There was air conditioning, a shower and stops in esoteric little towns in the middle of nowhere. I was in heaven, for three and a half days. 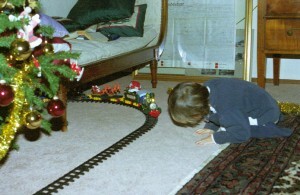 Alex thought that the train was the most fascinating part of Christmas 2000, and watched it constantly! He was not yet three years old. The train was our first Christmas train set, from Orchard Supply Hardware. What someone who has never been to the American West cannot imagine, especially someone coming from one of the European or Asian countries where people are packed together like sardines in cans that won’t open, is the vastness of the land, the sense of space almost everywhere you go, everywhere you look. You may have heard of the great conurbations of the West, like Los Angeles or the San Francisco Bay area, but collections of cities of that ilk remain the exception to the rule of inviting and enormous expanses of open range and barely populated land, of mountains and desert, of prairie and lake. It’s a GWR tank engine, as in “Thomas the Tank Engine, ” as in the company that my ancestors worked for for a quarter of a millenium, that Great Western Railway, running on the Paignton to Dartmouth Steam Railway. As we crossed the wide expanses of the prairies, stretching almost all the way from Chicago to Denver, and then the Rocky Mountains and the Great Salt Lake, I could feel myself opening up. Partly I was coming home. Partly I was crossing the country on a train. Mostly, I was languishing in that land, drinking it in, singing it: “this land is your land, this land is my land, from California to the New York Island . . . .” Woody Guthrie. Yep, you’d better believe it. Nobody loves the space here, the land here, like an immigrant from a crowded country! Marie-Hélène, Daphné and Alban may not have felt the same things as a train buff, but each experienced the sheer size of their new country, and glimpsed some of the cities that they had heard of in movies and on the news, in a way that they could not have done in a plane. That was my train highlight of these years. But the great thing about trains is that you use them from time to time in daily life, at least in England and France. So I didn’t need to drag the family to some special train place to satisfy my urge to experience trains. We regularly traveled on them, maybe to La Grée to see grand-père, or to London to see grandma. The latter brought the excitement of traveling through the Channel Tunnel, which opened in 1994, the year that we all moved in together. In the comfort of a TGV: five hours from Marseilles to Paris, city center to city center. Our first holiday in England with the children was in August, 1994. I forget if it was before or after Marie-Hélène moved in, but she brought Daphné and Alban to spend a week with me in South Devon. Nick and Tom were with their mother in California. We made that trip by car and ferry, but spent a day on Goodrington Sands, a beach near Paignton. As Daphné and I bathed (no-one else would brave the water! ), a steam train casually puffed its way across the top of the beach. We stood and stared. At least, I did, I was thrilled: the event was probably of less significance to Marie-Hélène and her children! I was fortunate enough to be able to participate in the annual Happy Valley School Rail Faire in May 2004. Here I am with Mr. Mac, another train freak who is the Faire’s organizer and a much-loved teacher at Happy Valley School. One of the sheer pleasures of living in France is traveling by TGV, le train à grande vitesse, which in one form or another has held the world speed record for real trains for most of the last 40 years, since it was first introduced in 1972. The French are way ahead of the US in two domains, childcare and trains! We still travel on TGVs, on and off, when we return on vacation. One of those trips was during the summer of 2002. We were on our way from Six-Fours on the Mediterranean to Marlow, via the TGV and Eurostar. Marie-Hélène snapped Charlie and me in the TGV as he worked on his World Cup soccer stickers: it was a World Cup summer, the French were doing well and Charlie and Alex were fascinated by the Tournament. Two obsessions in one photo! The 2004 Happy Valley School Rail Faire, an annual event inspired by Mister Mac when our children attended. I am helping uninstall the model steam train track at the end of the Faire. 2004 was one of those transition years which you only appreciate for what it was with hindsight. The trigger was my being laid off, not the best of feelings. The company treated me fairly, and I had plenty of time to reflect on what would be next. The first part was easy: I was going to take a few months off, doing no work at all! You can see how that decision was easy! While we river rafted down the Animas River, just outside Durango, Thomas the Tank Engine obligingly rolled by! The lay-off happened at the end of April. By June, I was on a road trip with Tom, to Colorado. When you take a road trip, you only have a dim idea of exactly what you’re doing: when you have a better idea, it’s not a road trip! We were Colorado bound: that became clear as soon as I started the planning. Haven’t seen those mountains for too long! 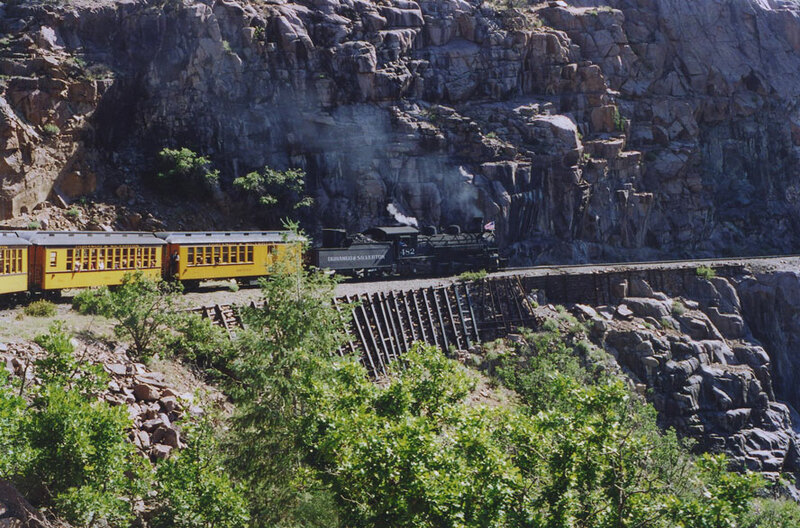 As plans filled out, the Durango to Silverton railway, one of the last working steam railroads in the US (there’s another shorter line in the Santa Cruz mountains a few miles from us), came into view. Tom and I spent a fabulous day taking that train and a fabulous few days exploring the Rocky Mountains. 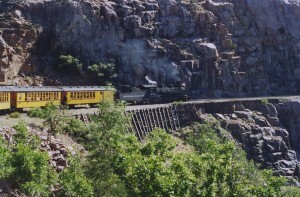 The real Durango to Silverton railway, splendid and scenic. Trains just keep popping up! In our later years together, I again began to gravitate toward them. During the summer of 2007, I arranged a week in England traveling around the country from Northumberland to Devon visiting relatives and friends, all on a train. As a US resident, I qualify for a BritRail Pass, which in its most interesting embodiment allows you to take eight days of train travel within 30 consecutive days. Much to my surprise, Charlie and Alex elected to accompany me on that trip at the last minute, rather than stay at La Grée with their maman as had been planned. The rural charms of La Grée were becoming less satisfying as they approached adolescence. Instead, they visited English family and met English friends, and I had the unrequited pleasure of wandering on trains with Charlie and Alex! Saw this GWR steamer, Lydham Manor, during the 2010 trip, before the boys arrived. 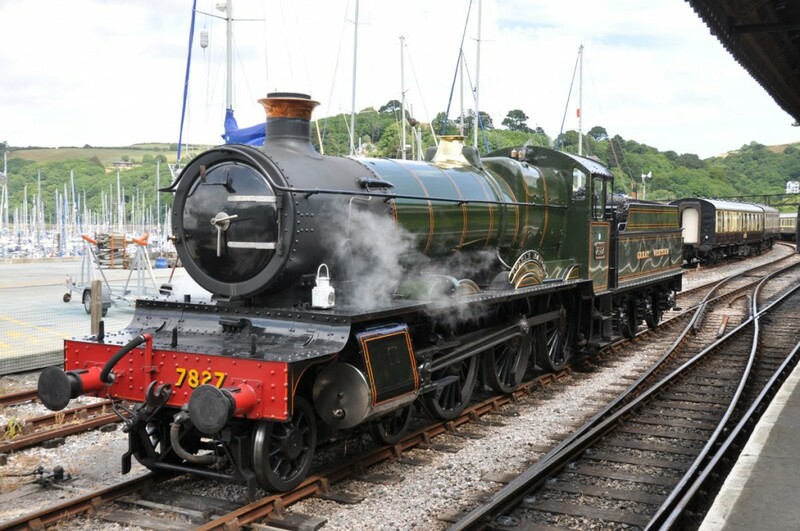 It’s at Kingswear station (for Dartmouth), having just hauled us from Paignton. This was the kind of steamer I trainspotted as a boy.